I have recently published a few articles on the topic of Annihilationist (a.k.a. 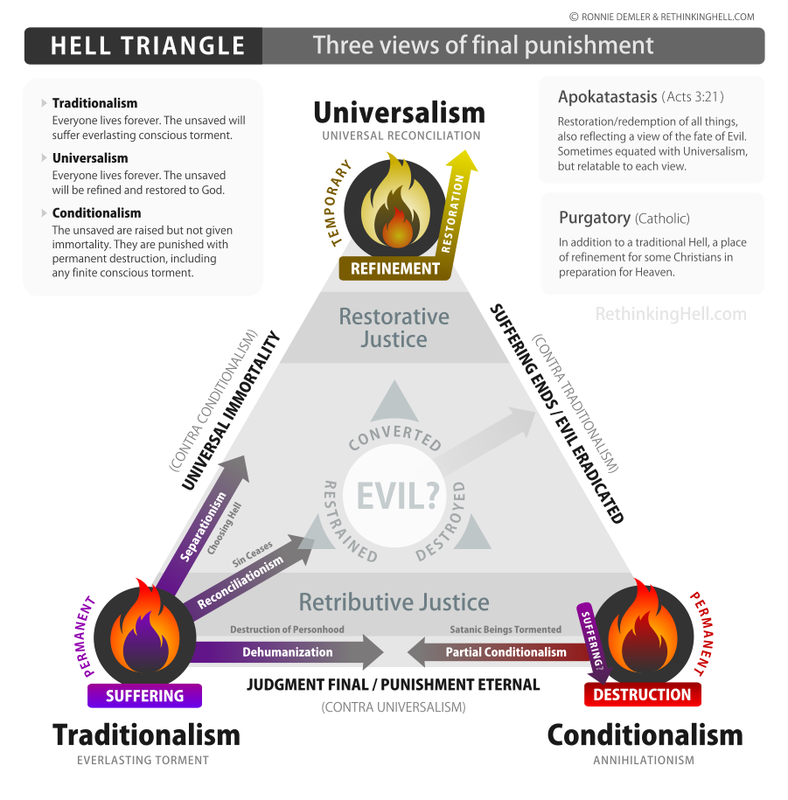 ‘Conditionalist’) view of hell, which claims that the Bible does not teach eternal conscious torment for the lost (the Traditional view), but that those who fail to receive Christ are punished according to their deeds, then destroyed. This view is growing in momentum among Evangelicals, and has a home base over at RethinkingHell.com. I have noticed, not surprisingly, a knee-jerk reaction among conservative Evangelicals against this ‘new’ view, and quite a few misunderstandings. However, I urge my more conservative friends to enter into dialogue on this, at least enough to understand it correctly so that their refutations are grounded in what is really being claimed, rather than straw men. Many Evangelicals were rightly alarmed when Rob Bell published Love Wins, his book claiming that Christian Universalism, i.e. ‘everyone will eventually be saved through Christ’ was the truth. This was distressing because Rob was a darling of the Evangelical movement, and part of the very innovative, intellectual, and influential Mars Hill Church. 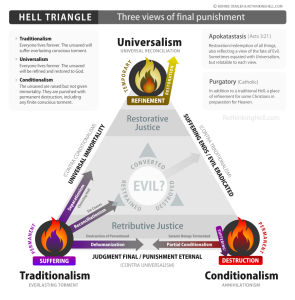 But as the diagram to the right shows (courtesy of rethinkinghell.com), Conditionalism has more in common with Traditionalism than Universalism. A concern for what the Bible really teaches, rather than the doctrinal traditions we have inherited. A concern that the Traditional view is a stumbling block to many people, who see eternal conscious torment as unjust. Are we putting this stumbling block in the way of those who might otherwise consider our gospel more seriously? We need to survey the biblical materials afresh. I do plead for frank dialogue among evangelicals on the basis of scripture. I also believe that the ultimate annihilation of the wicked should at least be accepted as a legitimate, biblically founded alternative to their eternal conscious torment. ~ Evangelical Essentials, p. 319. I myself initially left Christianity in part because I felt that eternal hell was an unbalanced, and unjust punishment for temporal crimes done mostly out of ignorance, if not fallenness. I returned to Christianity later, holding on to and articulating the arguments for the justness of hell myself. I was, however, relieved to see that perhaps the Traditional view is actually not what the Bible teaches. (b) we are concerned for the lost who might be turning away from the gospel due to the potentially false Traditional doctrine. Some recent articles have appeared attempting to brand Conditionalism as a clear heresy by labeling it ‘another gospel,’ a clear reference to Paul’s admonition in Galatians 1:8 that anyone who teaches another means of salvation other than Christ should is accursed and a heretic. Here’s the simple answer to that claim – Conditionalists do not debate the means of salvation at all – that Christ’s substitutionary death paid the price for man’s sin, and that faith in Christ is the means to reconciliation with God. What we do debate is the nature of the punishment of the wicked. We agree that there is a punishment. If one considers this part and parcel with the gospel, I am not sure what else I can say, except read this longer defense. Conditionalists argue that their view is the more straightforward and biblical exegesis of the relevant passages. Rather than taking them out of context, or explaining them away using some historical/cultural contextual argument (as some do with homosexuality), Conditionalists are calling for a straight up, passage by passage, and holistic biblical re-examination of the Bible passages as their primary argument. Just as an example, as yourself – do the following passages on first glance (and we will need to take more than a first glance, but for argument’s sake, start this way) seem to support the view that punishment is ongoing, or merely a cessation? Don’t just be defensive, THINK! What if you are wrong? We Conditionalists ask ourselves that question, and have done our homework to find out what the best answer is. You should too. Surprisingly little is said about Hell in the most famous Christian creeds, as I’ve excerpted below. At whose coming all men will rise again with their bodies; And shall give account for their own works. And they that have done good shall go into life everlasting; and they that have done evil, into everlasting fire. Note that the question of what everlasting means must be answered Biblically – does it mean that punishment is ongoing and forever, or does it mean that the fire will permanently consume those condemned into it? The reason that this is not further elucidated can have two possible answers. First, that the authors assumed that everyone would know what they meant by ‘eternal fire’ (in the one case where it is actually called out). But let me ask you – since when to creeds, which are meant to elucidate the exact particulars essential to the faith, assume you understand what the details are? There is another credible explanation, and that is that the fate of the wicked is not an essential doctrine, but a secondary one. Salvation is through Christ, but one’s belief about the actual character and duration of Hell does not make or unmake a Christian. Challenging a long tradition is not undertaken lightly, nor do we expect to change minds or Evangelical culture and doctrine overnight. However, those of us in this movement do view ourselves, not as liberals with a low view of scripture, but quite the opposite – Evangelicals with a high view of scripture and a great concern for the truth, and for those who might be stumbling away from Christ due to our doctrines. And those who share our concerns need to take this discussion very seriously, because it’s exegetical power is real and will not go away as just another liberal doctrine. Like the doctrine of infant baptism, it may take time, and persecution of those who propose an alternate, more biblical view (in that case, believers’ baptism), for this doctrine to find its place as the accepted view. May God hasten the day that this is resolved, for the sake of the Church and those who need the gospel.